while writing this review i'm on my 6th run of the anime and i still enjoy it very much it's simple in some areas but it's done so nicely i really hope for more seasons. The list keeps going, but i think you get the point, the show so far isn't inherently bad, its just nothing new. Sure theres better anime, but theres also worse, the humor is amazing for what it is there is always a point i'll laugh at. The protagonist is the classic harem lead: heart of a saint, power of a god, intuition of a gnat and unable to allow himself to fall for any one girl. I love the story idea of using a smartphone in another world but I really wish they had actually invested into it rather than use it as a new idea for yet another harem anime with extra focus on "harem." Whenever there is fighting the overpowered hero shuts it down in an instant but if there is typical, say, "romantic mischief" then emphasis on that with a dose of "[Hero], you pervert!" and "I-I-I-It's not what you think!" and the unspoken "It IS what I think no matter what you or the truth says!" So if you can't get enough harem animes and their clichés, dive right in. If you want a show with a little more story than just clichés, keep looking. funny and easy to enjoy anime. i had a great time watching this anime. i wish for another season actually. The girls are hot the plot was interesting and the protagonist was super strong. Is he overpowered? Yeah sure, but all things considered it was owed to him in a way. anyway don't think/dig to dang deep and just enjoy! There is not a lot of originality to it and while that's fine there also really isn't anything in particular to this anime that makes it shine over other "Other World" animes. With other animes in the genre like slime, konosuba, overlord etc. All of them have something unique that stands out, something you can go to your buds and say "watch this anime for this reason". So if you need something to binge as long as it's an anime, this would satisfy you but if you are looking for something to make you want to watch this anime i don't believe you are going to find it. Overall, not terrible, but it does feel like this show was pieced together to make a quick buck in some sense. Yet, I still mostly enjoyed it for what it was. The animation isn't that great, but it isn't the worse I have ever seen in a show. The characters in this show feel as generic as tofu in some ways, but they are cute, so it does make it that much more enjoyable. The thing that is the weirdest about this show is that it feels like it was designed to be specifically enjoyed in western homes like in USA, Canada, Europe, and Australia (you know what I mean). I normally never think about this when it comes to pretty much every other anime I have watched in the past. Now, I don’t know if this is true. There are certain aspects to the show though that make it feel like a studio in Japan just wanted to do a quick cash grab to western audiences as they knew they know that we would eat it up. Does this mean it’s the worst show ever? No, it isn’t. Sure, it is lacking a major story, and some of the stuff is as generic as I do in my own home, but it keeps you interested in it as there are some interesting aspects to the show. There are only 12 episodes and trust me that is enough for this show. I doubt they will ever do a second season as I wouldn’t think there would be enough people interested in it to begin with. If you do decide to give it a watch, don’t feel bad if you don’t like it because this show definitely isn’t for everyone. Overall, could be worse, but also, could be better. You Need to Watch This Anime! 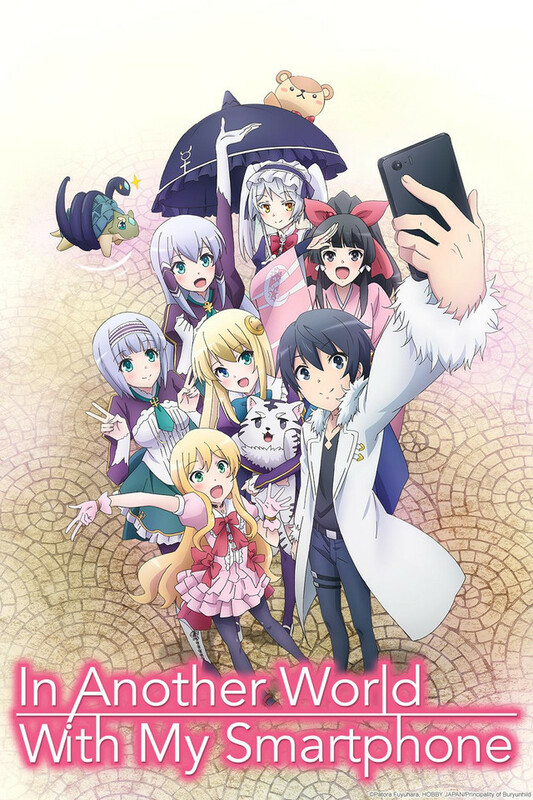 In Another World With My Smartphone was the first anime I finished on Crunchyroll, and I loved it! I'm a fan of Isekai, Fantasy, and Romance, so this was like an anime sent from heaven (literally). I don't know if they're going to make a season 2, but they really should! it's not a good show, not an show that does anything new (its meagre plot notwithstanding) but it can still entertain you if your bored. its cute loli pandering and just overall cute anime girls only push it so far so don't expect anything interesting, it's just barely entertaining. Absolutely loved this series. can see why a lot of people dislike it because everything goes very conviniently for the MC, but this is an almost perfect embodiment of what I like in books and in anime. Instead of the second hand embarassment I felt from watching Subaru mess up in RE:Zero, which by the way I loved too, it genuinely felt good when things went right for the MC. The story is not very deep but the show is really easy to sit down and watch.